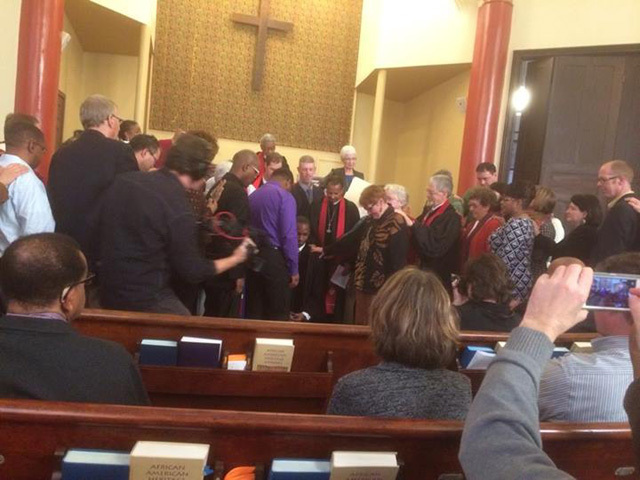 With those simple but historic words, we at Madrona Grace Presbyterian Church welcomed a new associate pastor, and the wider church welcomed the first openly gay African American man ordained as a Teaching Elder in the PCUSA. After the passage of 10-A, we at Madrona Grace began encouraging Bertram to finish the ordination process. At first, Bertram wasn’t sure that God was still calling him in this way. He had a good job, a loving church community, close friends and a full life. But when you meet Bertram, it’s pretty clear that God has given him some special gifts, so the Session persisted. We were, at last, able to help Bertram see that God was indeed calling him to ministry and he agreed to resume the ordination process. So, on a crystal clear, cold winter afternoon we gathered in the sanctuary of Madrona Grace Presbyterian Church to celebrate. And did we ever celebrate! Friends and family came from north and south, east and west. African American, European American, and Asian American, straight and gay, male and female, long-standing members and people who hadn’t stepped foot in a long time. The service reflected the diversity that is Madrona Grace, with music that ranged from classic hymns of the church to gospel, children leading the prayers and a gift to Bertram from the congregation, a stole made of Kinte cloth. After a stirring sermon offered by the Rev. Michael Livingston, where we were reminded that to seek justice and love for all of God’s children, Bertram was anointed with oil, knelt in front of the congregation, and received the laying on of hands. In the charge to the newly ordained, the Rev. Geddes Hanson reminded Bertram, and all of us, that pastors are agents for change and not veterinarians. In my charge to the congregation, I reminded all present to take the lessons learned in the past and use them to build our future. As I watched the assembly receive communion, I realized that this body, young, old, black, Asian and white, this body of friends and family, this body of LGBTQ and straight, this body of God’s people, was a true representation of the Beloved Community that we seek. We were there to celebrate Bertram yes, but in the process of celebrating history; maybe, just maybe we were being given a glimpse of what heaven looks like. Sankofa, a concept derived from the Akan people of West Africa, teaches us that we must go back to our roots in order to move forward. That is, we should reach back and gather the best of what our past has to teach us, so that we can achieve our full potential as we move forward. So, as we celebrate this historic day and welcome Bertram as the first openly gay African American man ordained as a Minister in the PCUSA, let us remember that we are a church where all the gifts given by GOD are celebrated. Let us remember that we are a church where the barriers of race, class, gender and sexual orientation are seen for what they are: artificial, human created conditions; not ordained by GOD. Let us remember that we are a church that welcomes the outcast, the marginalized, the broken in body, mind and spirit. Let us remember that we are a church that advocates for justice and equality for all of God’s children, in the wider church and in society at large. And finally, let us use the lessons the past has taught us to build the beloved community GOD is calling us to be. Nathan Sobers (2015) is a ruling Elder at Madrona Grace Presbyterian Church in Seattle, WA where he currently serves as Clerk of Session and parish organist and serves as Co-Moderator on MLP’s board. For Nathan, participating on the MLP board sits at the intersection of his interests of social justice and faith. He believes that combining the two makes him a better Christian and a better human being. In 2012, Nathan and his husband will celebrate their 26th anniversary. To God be the glory. Congratulations to you my brother in Christ. Seattle will win. Thanks Bertram. 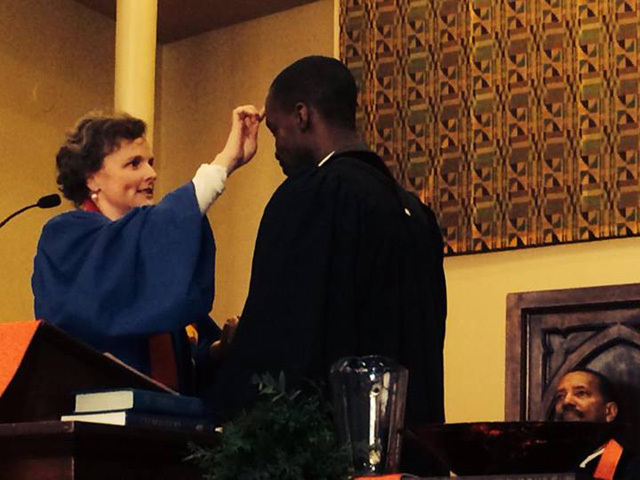 Bertram, tears of thankful joy came to my eyes as I read of your ordination. May your ministry always glorify God, and may you and yours be blessed! Congratulation to Bertram and to the wonderful congregation he is a part of. The diversity present in your congretation is not typical in most Presbyterian Churches. Perhaps we can all strive to make all of our congregations closer to the example you have given us. As we all know, God loves everyone–a lot!